During the autumn and winter months our dinner tables are full of rich, decadent dishes but sometimes a break from this is needed so this prawn and courgette pasta does the trick. The idea behind this came following a recent trip to Italy where they served a similar pasta dish which was light and oh so moreish. Take a leaf from the Italian’s book and keep the sauce as light as possible. 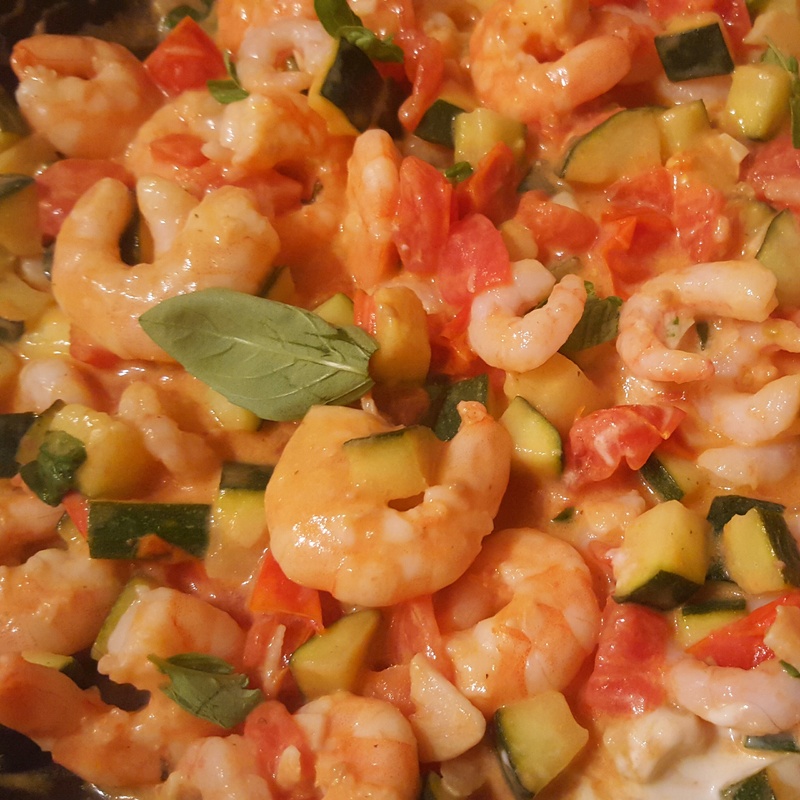 I used raw king prawns to make sure they stay juicy when cooked; you can use a combination of king prawns and smaller prawns if you like but throw in the smaller prawns later in cooking so they don’t dry out. 1. Get going by bringing a large pan of water to the boil and cook the penne according to packet instructions; aim for an al dente finish. Drain well and set aside whilst you make the sauce. 2. Take a frying pan and add a glug of olive oil. Cook the garlic and shallot until it is softening but make sure it does not turn golden. Add the courgette and tomatoes and cook for a further minute or so. Pour in the white wine and reduce by half. Reduce the heat to low and stir through the crème fraiche before adding in the prawns. Simmer until the prawns turn a gorgeous blush pink before finishing off with a sprinkling of fresh torn basil and a squeeze of lemon juice to lift the flavours. Remember you can adjust the creaminess of the sauce by adding more crème fraiche or loosening up the sauce with a splash of water if you find it becomes too thick. Prawn and courgette penne- quick, light and a cinch to make! This scallop, prawn and crab linguine is a celebration of seafood. I have paired it with the lightness of creme fraiche, the tang of lemon and the freshness of parsley to lift the dish to dizzy heights. A hint of red chilli also works well here if you like to add an extra layer of flavour. The sauce should lightly coat each strand of pasta; if you find it is a bit too thick then add a splash of the pasta water to loosen it slightly. 1. Start off by boiling a large pan of water and cook the linguine according to the packet instructions; drain when al dente. As the pasta starts off then get going on the sauce as this is relatively quick. 2. Take a nonstick frying pan and heat the knob of butter over a medium heat. Sear the scallops for approximately 3 minutes on each side until golden, remove from the pan and set aside. Cover with foil. The scallops I used were large and I then cut them across so give two discs so it was easier to toss through the pasta. 3. Add a glug of oil to the pan and fry off the garlic and chilli (if using) for a minute or two. Pour in the wine and cook until reduced by half. Lower the heat and add the creme fraiche, a good squeeze of lemon juice and the prawn and crab. Simmer until the prawns are cooked through and a beautiful blush pink. Just before this, add the scallops back into the pan. Before serving sprinkle through some parsley and toss the scallop sauce through the pasta. 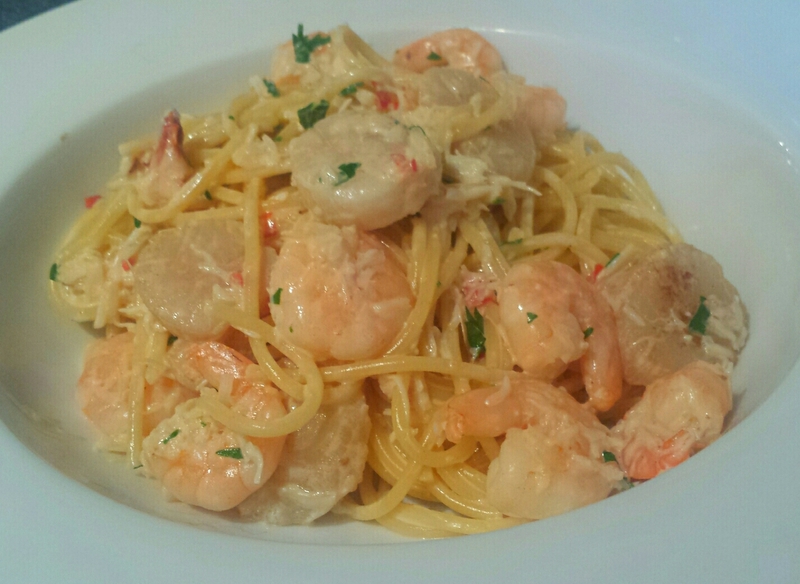 Seared scallop, prawn and crab linguine- simple, fresh and decadent! Sweet roasted garlic and spinach risotto was born after being given a huge bag full of homegrown spinach which would be sacrilegious to waste! Don’t think that if you make this you’ll be walking around the next day sending people running and fending off vampires as roasting the garlic makes for a sweet finish. Use the freshest garlic you can for the best flavour. 1. First thing’s first! Preheat the oven to 200c/ 180fan and place the halved garlic bulb cut side up on a baking try. Drizzle over some olive oil and roast for around 25-30 minutes until the garlic is sweet and tender. Remove from the oven and set aside. 2. When you’re ready to cook the risotto, take a large pan and add a knob of butter over a medium heat. Cook the chopped onion and pancetta cubes for a few minutes until softening and the pancetta is turning golden. Add in the arborio rice and make sure that the buter coats each grain. Take a ladle and add in the first lot of stock and lower the heat to a simmer. Squeeze out the garlic cloves, mash down lightly with the back of a fork and add to the rice. 3. As each ladle of stock is absorbed you need to add in another until all the stock has been used. When the last ladle has been added pop in in the shredded spinach and stir well to combine. Take the pan off the heat and add in the creme fraiche, a squeeze of lemon to taste and some parmesan cheese. Taste and adjust the seasoning as required. Serve the risotto is warmed bowls with a final grate of parmesan and a pancetta curl or two (make more than you need in case one jumps into your mouth whilst cooking!). To make the curls take thin slices of pancetta and cut a slice into thirds. Wrap them loosely around a skewer, remove gently and place on a baking tray. Cook for a couple of minutes at 180c/ 160fan. Simple! 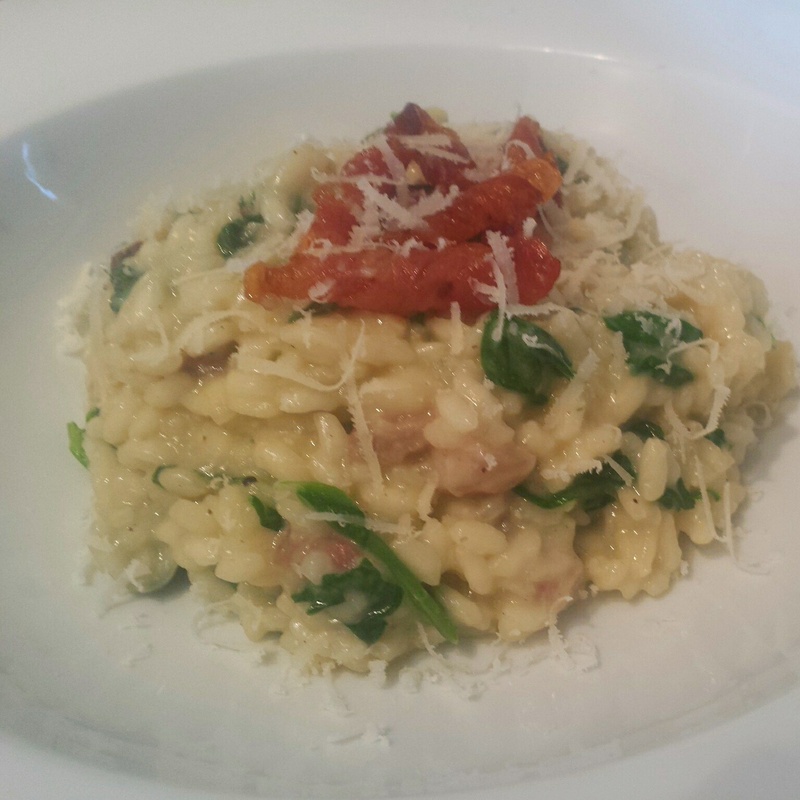 Sweet roasted garlic and spinach risotto with pancetta curls- treat yourself to a little luxury! This risotto uses an unusual combination of ingredients but it’s a marriage made in heaven; the slightly bitter edge of radicchio, the smoky pancetta and the caramelised finish of the balsamic. I used sliced English pancetta from a Hampshire butchers but use whatever you can get your hands on. 1. Get going by melting a knob of butter and a glug of oil in a wide pan before adding the shallot and garlic. Cook until softened. Next up goes the diced pancetta and cook until nearly crisped. 2. Pop in the rice and stir well so each gratin is coated with the butter. Add the radicchio and a ladleful of stock. Bring to a gentle simmer and stir from time to time, remembering to add in more stock as the rice absorbs each lot. 3. Just before the risotto is ready, heat a frying pan and dry fry the pancetta slices which you have cut into thirds. As the slices turn golden, remove them from the pan and set aside. 4. When your risotto is ready to serve simply take the pan off the heat and stir in the creme fraiche, balsamic, a small amount of extra butter and some of the parmesan and leave to sit covered for a few moments. Pile high onto warmed bowls and top with the crispy slices of pancetta. 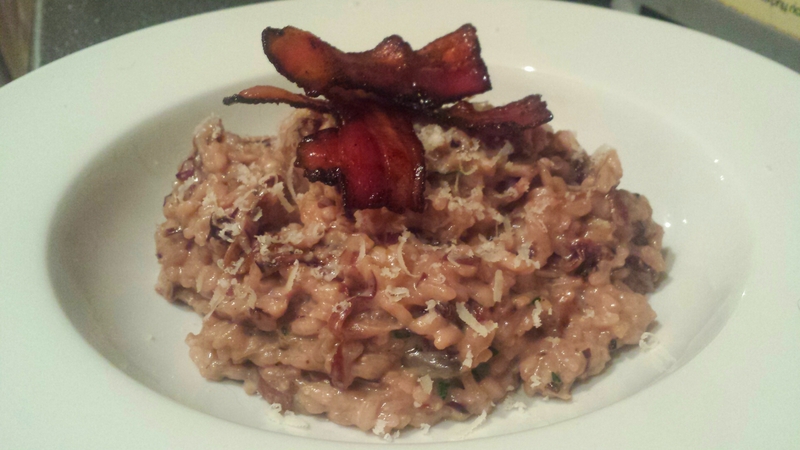 Pancetta, radicchio and balsamic laced risotto- a new twist on a classic that you won’t regret!